Fibre networks provide the capability of transmitting Ethernet traffic from A -B using light technology. Fibre usually has a speed benefit over Copper cabling. It’s also a flexible, space saving and cost effective alternative. Most fibre patch cords in the market today are Duplex, providing simple two way communication with fixed adapters at each end. Those adapters plug in to fibre patch panels and the other ends are then plugged in to SFP Transceiver modules installed in switches, servers and other hardware. 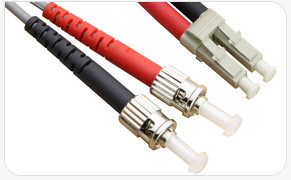 These patch cords can range from a small cabinet fibre patch of just 25cm or up to 50+ metres in length are available in both Single and Multimode variants. Singlemode patch leads are usually Yellow in colour and are 9/125um – the 9 being the inside diameter of the cable that is measured in microns and the 125 referring to the outer cladding, before the jacket. OS2 is the latest singlemode standard replacing the OS1 construction – still the same speed capabilities, just a better manufactured cable. Singlemode fibre tends to be installed over longer distances, so ideal across campus sites or a logical choice for distances of over 200 metres. When it comes to Multimode there are a few more options available, historically OM1 62.5um tends to be Grey in colour, with OM2 50/125um available in Orange. These simple colour coding standards allow for installed links in cabinets to be easily identified without the need for testing. OM1 is still widely used for legacy installations but has speed limitations if you require 10 Gigabit performance, whereas OM2 will operate faster and over twice the distance. All duplex fibre leads are LSZH – so have a Low Smoke Zero Halogen outer sheath each core is 2.8mm in diameter, although a thinner 1.8mm is available on request. 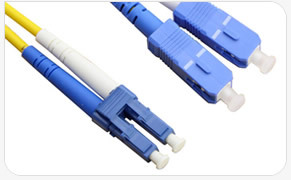 When it comes to OM3 50/125um & OM4 50/125um they are by far the most popular duplex fibre cords on the market today. The OM3 variant is available in an Aqua Blue or an Orange colour choice, whereas the OM4 is provided as Aqua Blue or Heather Violet – a Pink shade. OM3 and OM4 Multimode Fibre Cords are a much better quality manufactured lead than OM2 – providing fasters speeds over much longer distances. All OM3 and OM4 Patch leads are laser optimised during manufacturing, with the latter having twice the treatment as its OM3 counterpart. This process identifies any quality issues that might affect the spread of light as it travels down the fibre. All of our OM3 & OM4 duplex fibre cords have UPC ‘Ultra Polished Connectors’ and we can also supply APC ‘Angled Polished Connectors’ Fibre Cords, on request. As well as the standard industry lengths of 1m, 2m, 3m we stock various incremental lengths such as 50cm, 1.5m & 2.5m in OM4 and up to 33 precise lengths in the OM3 Aqua colour. Today’s multimode fibre networking termination of choice is the smaller LC-LC block connection, it’s great for high density patching, however we do still offer LC-SC, LC-ST, SC-SC, SC-ST & ST-ST for legacy moves and changes. We can still supply older technology such as multimode MTRJ adapters (historically used with 3Com switches) or FC singlemode fibre cables, and if you’re looking for real cutting edge solutions we have a large MTP fibre portfolio for 40Gb and 100Gb fibre installations. 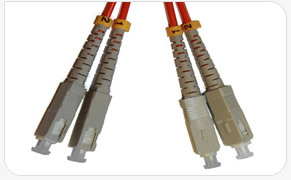 All fibre patch lead options are clearly displayed on https://patchsavesolutions.com and we also have a comprehensive range of pre terminated reels and panels if you are looking to save some time and money on a future installation.